That’s right I said it. And you probably already think it. Nurses do GREAT work. All of the time. In every way. So why the title of this post? Even nurses who begin a nursing career with the best intentions experience nurse burnout. They get stressed. They feel tired. And, at some point in their nursing career, they question their decision. I have interviewed a TON of nurses. I mean hundreds. From the Your Next Shift podcast to The Art of Nursing and everything in between, I like to hear what nurses have to say. And when I do- I also hear about what people do not want them to say. I think that sometimes we forget that a nurse is a human being. We can apply this to any role that we assign ourselves. Teacher. Author. Lawyer. Doctor. Mom. Just because you have a title, does not mean that you are not also the human being inside. First and foremost, a nurse is a person. Too often we think that a nurse is some kind of super hero that does not have to eat, sleep, or use the restroom. A nurse has needs. Desires. And must take care of oneself. In fact- think about your car. Do you treat it better than you do yourself, as a nurse? A car needs gasoline (or batteries or electricity… or something) to run. It will not run if you just look at a car and say: “Start driving”. You have to fuel it. Same thing goes with a nurse. 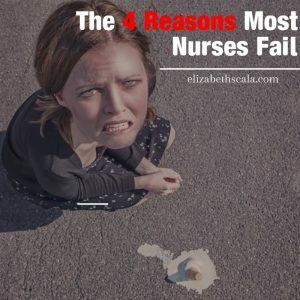 So Why Do Nurses Fail? Nurses experience burnout when they do not take care of themselves. When they are asked to do too much with even less. When they are not supported by themselves, their colleagues, upper management, or even their organizations. While the post title and question above uses the word ‘failure’, any business owner (and some others I have met along the way) will tell you that the word failure is actually a GOOD thing. In fact, one of the five traits of high reliability organizations is that they are preoccupied with failure! Why is that? Because they see failure as an opportunity to grow. To learn. 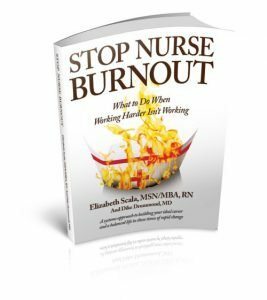 I know in my own nurse burnout experience… I did not let it get me down. In fact, it was the catapult that blasted me full speed ahead to where I am today. They don’t ask for help. Remember the whole superhero thing discussed above? Nurses can do it all, right? Wrong! Even though that is what they think. Ever go up to a nurse and ask if she/he needs anything… what do they say? “No. I’m fine.” YOU’RE NOT FINE!! A nurse will succeed when she/he is able to realize that at times help is needed. An even greater nurse will then ask for it. And the BEST, absolute best nurse… guess what they will do? Be able to receive that help! They are ‘yes’ men and women. It goes hand-in-hand with the above. A nurse gets called in for an extra shift, “Sure, I can be there in 20 minutes.” A nurse is asked to stay late, “I just have to call and cancel my hair appointment.” Nurses are always willing and ready to help out. However, many times it as at the expense of their own wants/needs. If you want to thrive in nursing you are going to have to balance your yes and no responses. At times, say yes to your staff, colleagues and work place. At other times- say yes to you! They devalue their worth. Ever seen an image of a nurse online that depicts a martyr? How about a servant? Or some kind of religious nun? And why do I still hear things like “I’m just a nurse.” People- you are so freaking amazing. You are a rock star, remember. You need to realize the value of your worth! I have struggled with this one in the past. Call it low self-esteem, a fear of rejection, or any combination of unworthiness… I have had to get help with this. In fact, that is something that you can do if you need a boost in confidence too. 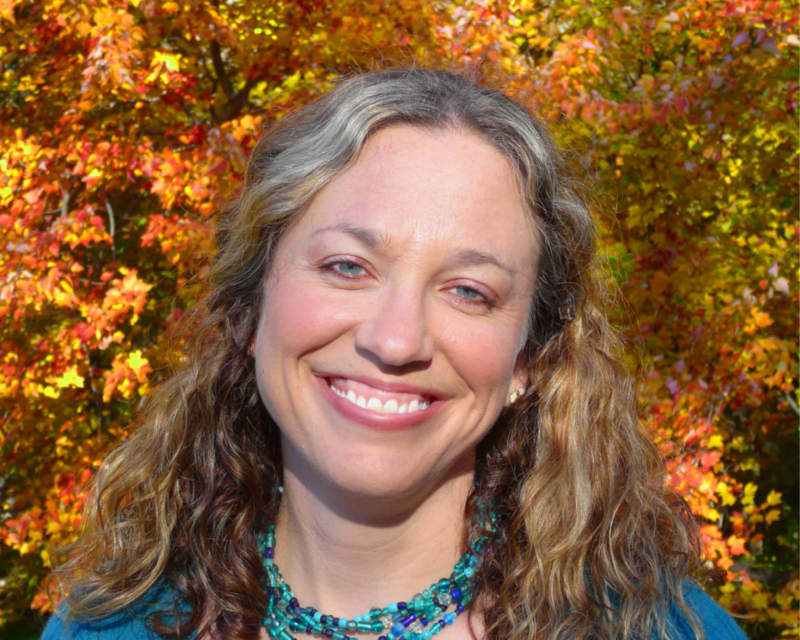 Check out hypnosis; try journaling; or hire a coach. Often others can see more than what you are able to! They are preoccupied with external data. Another one I have to watch out for. See, in addition to some of the holistic practices I enjoy, I am also extremely analytical. My role in a research program confirms that. While we can talk about data, here I am not exactly referring to scholarly work and evidence based practice. What I am describing is that a nurse sometimes looks outside of themselves- at everybody else- for what’s to blame. It could be the new policy that was just instituted that is making your job miserable. Or the bad boss who does not know how to lead a team. It is everyone else that is making you burn out, right? Not really. Sure, some of the external pressures can cause us stress… but it is actually how we perceive, handle, and cope with them that makes all of the difference. Look inside to see what you can change to make your workplace a more enjoyable experience. Let’s hear from you! What would you add to this list? Why do you think nurses experience burnout and what can be done to help handle it? Leave a comment below and thanks for reading! Elizabeth you have pointed out some good points. So we rally the help around us to help deliver the care we should and learn to say no when we really have to. Shouldn’t we also look into the mirror before shift and remind ourselves of our true value (you know “positive self talk” to not only take on the day but to also BE the catalyst for the one who didn’t)! A quick reminder that we have the inner power to BE the difference! Great points, Renee! Thank you for adding this encouraging comment to the discussion. Appreciate it! Thank you for sharing your experiences. Sounds like a powerful internship. Thank you for bringing this to the discussion! Wow to meet Elizabeth Kubler Ross-what a great experience. Oncology is a tough area but those who are good are so important to patients. Thanks for your work! You hit the nail with ” how we perceive, handle, and cope with [stress]”. I am ever practicing (not always achieving) mindfulness of my surroundings and how I am affected and especially how I then give that back to those around me. As with everything else in our lives as humans first we must battle daily with the choices we make, whether between an apple or a brownie for a snack to how we internally handle the stressors of a patient or co-worker encounter. We may not always achieve the affect we are looking for every time but that is what practice is about, we are always given another chance to improve and learn next time. Thank you so much. Appreciate you sharing your comments! Enjoy the day. Great post Elizabeth! You hit it right on, I could see all of these traits in myself and many of my nurse friends. Somehow we put ourselves into the position where we feel that it is okay for people to continually make unreasonable demands on us, we tend to neglect ourselves in order to make others happy, then when we can’t meet the demands we blame ourselves.I did not realize how much I was burning myself out until I left the bedside and pursued business ownership. Thank you for writing this and I am hoping that other nurses will be able to recognize some of these behaviors within themselves and work toward change before they burn out. I am not sure why so many of us feel that we are being selfish when we care for ourselves? Appreciate your honest feedback, Sarah. I am so glad that you enjoyed the article. Thank you for sharing! You hit the nail on the head again Elizabeth! We also need to get your message out to nursing students….as early in the journey as possible. Great to hear, thanks Donna!! I would be interested in learning how one (myself, a nurse) goes about finding a nurse coach. You can google ‘nurse coach’ and MANY responses will show up. You can also google ‘nurse coaching programs’ and there you will find places where nurses learned to be coaches (which many of them have directories). Or you can check out my pal, Keith Carlson (nurse Keith Carlson, if you google). There are TONS of nurse coaches out there. The American Holistic Nurses Association has an entire program on nurse coaching and I am sure there are many of wonderful graduates. Important for all trying to make it! Thanks for the insights… Now to put them into practice. Great post Elizabeth! You make some very good points that are so common sense. I love that about you. In truth, we often can’t see what is right in front of our faces. 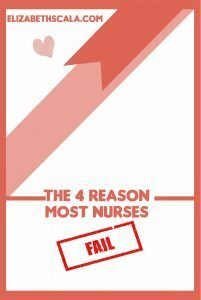 Your 4 reasons for burnout describe many of us who go into nursing, but it isn’t so evident to ourselves until we stop and think about it. Perception! Now, couldn’t we just write about that for hours? Thanks for another great post. Thank you very much, Carmen. So glad that you enjoyed it! Elizabeth, Thank you for your insightful and accurate post. New Nurses should be told it’s alright to change practice settings if they find a particular specialty overwhelming. I am reminded of the line from the movie The Bucket List. Actress Beverly Todd’s character is a nurse married to Morgan Freeman’s character Carter Chambers & she states “I’ve had a front row seat to more human suffering and misery than….” This is so true and even just a a few years exposure can and does affect a person. Taking time to process your own feelings of distress and talking to others can help and I encourage it. Experienced nurses sometimes fail to take new nurses under their wings as they transition from academia into practice. This is a wonderful opportunity to value ourselves and others and enhance collegiality. Thanks again! Great points, Christi. I appreciate you sharing your thoughts and reminding us of that wonderful movie! It’s one of my favorites. Feel free to share this article with any nurses (new or not) that you know. Enjoy the day! I feel like we are in a unique profession that when we are feeling burned out , we can change to a new field of focus. It is only when we recognize we need to change, we will succeed as opposed to failing. I Know it is not easy sometimes to come to conclusion. It is a eureka moment when do, so don’t forget to share with the newbee’s! Great points, Loretta. Thank you for adding this to the post!